A growing student loan default crisis and college affordability are among the biggest topics in education, and the new chairman of the House Committee on Education and the Workforce found himself talking much about affordability. The committee will actively explore ways to reduce the cost of college and continue to look into student loan servicing, he said. Asked about the possibility of the federal government discharging all outstanding federal student loan debt, Scott said the idea “might be nice.” But he suggested alternatives such as helping borrowers repay through affordable income-based plans, community service incentives and tax deductions for interest and perhaps principle paid on loans. “I think a total discharge is a little unrealistic,” he said. “Comprehensive reauthorization” of the Higher Education Act by the end of the year will be a priority, but has become more complicated given recent cuts to financial aid, Scott said. 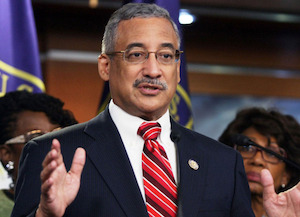 A native of Newport News, Va., Scott was the first Black person from Virginia elected to Congress since Reconstruction. He has had a key role in passing education legislation, including co-author of the federal Every Student Succeeds Act (ESSA). The legislation, signed into law by President Obama in 2015, was created to support high schools where at least one-third of students don’t graduate and schools with groups of underserved students who demonstrate low performance consistently. Asked to describe the committee’s agenda for Congress, Scott said the “first order of business” is to review the ESSA. The law built in flexibility for compliance, but not in terms of ascertaining achievement gaps, he said. The outcome should be that high school graduates are able to enter a state college and matriculate without having to take remedial courses, but some states have not implemented plans as aggressive and rigorous as lawmakers anticipated, Scott said. Scott also said effort will be put behind passing the Rebuild America’s Schools Act introduced last year. The legislation was crafted after a Department of Education study released in 2014 that said it would cost about $197 billion to bring all public schools into good condition. The $100-billion program would create 1.9 million jobs aimed at renovating and constructing new schools to replace outdated facilities. “The elementary school I attended in the Fifties is still there, and that’s not unusual,” said Scott. He also touched on the importance of holding accrediting agencies accountable, minority serving institutions getting more of their fair share of contract grants and a need to address “problematic recommendations” regarding school discipline put forth by U.S. Secretary of Education Betsy DeVos. Scott demurred on a question about whether the committee plans to launch investigations into the Department of Education. “We’ll do oversight,” he said.